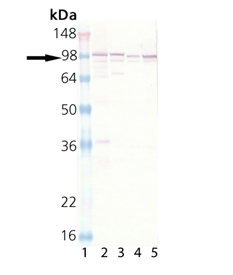 Immunogen: Synthetic peptide corresponding to the sequence near the C-terminus of dog calnexin. The sequence is completely conserved in human, mouse and rat. Scientific Background: Calnexin (CNX), an unglycosylated resident ER transmembrane protein, together with Calreticulin (CRT), plays a key role in glycoprotein folding and its control within the ER, by interacting with folding intermediates via their monoglucosylated glycans. Calnexin associates with newly synthesized monomeric glycoproteins and only recognizes glycoproteins when they are incompletely folded. Furthermore, Calnexin has been demonstrated to function as a molecular chaperone capable of interacting with polypeptide segments of folding glycoproteins.